This traditional tie rack will help organize your ties and keep them neat and unwrinkled. The classic ball end keeps your items from slipping off. This decorative wall mounted coat rack is coordinates seamlessly with other products from the series providing an elegant look throughout the home. - 15"L by 2 3/4"W with 9 pins. - 18"L by 2 3/4"W with 11 pins. - 24"L by 2 3/4"W with 15 pins. Each pin is 1-1/2" long. Mounting hardware included and measures 1 1/2" by 1 1/2". Perfect beside a front or back door, or even in the hallway, this Modern Hook Bar will easily hold the family's coats, hats and scarves and will surely add charm to your entryway. This wall mounted antique coat racks coordinates seamlessly with other products from the series providing an elegant look throughout the home. 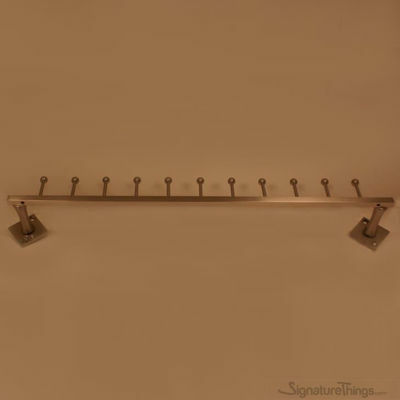 Use this sleek hook bar to organize coats in the mud room, hang robes in the bathroom, stylishly hang those designer purses, or a variety of other uses. This Decorative brass hook bar can be used in the bedroom, kitchen, bathroom, toilet, kitchen, living room etc. Easily mounts to a wall. Add a bit of extra storage space and convenience with the round ended modern hook bar. Featuring a decorative back plate and circular hooks, it's sure to look great in any style home. Made from premium grade brass material. This modern hook bar coordinates seamlessly with other products from the series providing an elegant look throughout the home. This Wall mounted Modern Hook Bar will easily hold the family's coats, hats and scarves and easy to fit with fixing screws on your wall or door, whichever enhances your home interior. This is with a Double Row of Brass Hooks, So it can hold more accessories of yours. 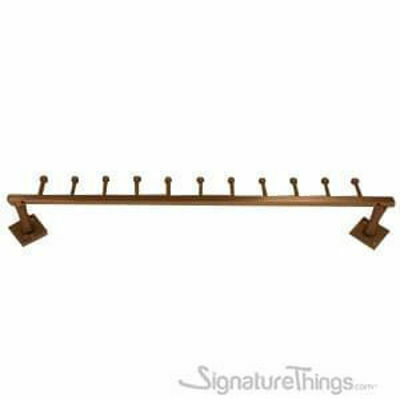 This space saving wall mounted tie rack adorns two rows of ball-end pins. Made from premium grade brass material. Perfect for hanging and organizing your face towels, bath towels, clothes, hats, purse, belts and other accessories in order. This unique hook bar is embellished with acorn shaped hook-ends. It will add that special touch of style to any room while helping organize your items. Its antique coat hooks coordinate seamlessly with other products from the series£¬providing an elegant look throughout the home.